Now, back to what I'm so eager to talk about today. When we first started Synonymous, we were contacted to design many kitchens and bathrooms through E-Design. I think this alone gave us a great kick start to our aesthetic, which is a mixture of sophistication and approachable luxe. We wanted these spaces to carry the look of the entire home seamlessly, which allowed us to curate special, cohesive spaces. We absolutely love bathroom design (check out a few that we shared a few weeks ago) and enjoy designing them from start to finish. 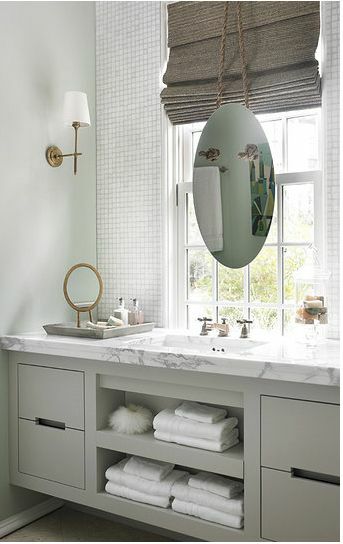 One aspect of bathroom design that we pay loads of attention to is the actual vanity style because it truly does play a huge role in the overall feel and look of a bathroom. Make sure you get the special "soft close" technology for ALL of your custom cabinetry because there's nothing worse than a slamming door or drawer. The soft close feature will be so useful for everyday living and, hey, you could slam that cabinet door all you want and it will still shut silently. If you plan on using white oak as the vanity material and looking for a smooth grain pattern, the wood should be "rift sawn" as this will leave you with a perfectly vertical grain pattern. If you don't mind the graining of the wood, you may get away with a natural grade option. Planning on painting your new vanity with a gorgeous paint color you've had in mind? Make sure your carpenter uses "Paint Grade Wood", which offers a wood free of heavy knots and patterns, plus a smooth, flat surface to paint on for a gorgeous result. For different effects, paint sheen is great. For a timeless vanity design we recommend an eggshell or satin finish on your cabinetry. Don't ignore your countertop as you may go with a standard thickness or elevate the design with a thick, 3+ inch option. Single vanities are known to be quite small, ideal for limited spaces and fit a single sink on them. With small design, we love the idea of going big on impact because it is a great opportunity to showcase creativity. We tend to gravitate towards storage filled vanities, no matter the size. This means drawers, more drawers and storage behind closed doors. I really love vanities with drawers above all because I find drawers look chic and are easier to organize. Doors in vanities usually means the storage behind it is bigger, hence harder to organize unless you have a well thought out system in place with the use of baskets and the likes. But then again, what happens to the space above? You know what I mean, right? Sure, get yourself some cabinet dividers like the ones we've all used in kitchens, but that alone is a bit of a "blah" moment :D What do you think? Not everyone has the luxury of having a double vanity in their home. I know here in New York City the common household doesn't. But if you do, that's awesome and let me tell you there are loads of vanity styles out there that look so good and are specially designed for the double, his and hers sinks. I love double vanities, yep! I also realized that I love open shelving on double vanities... you'll notice below. One way or another, all vanities to me must include drawers, that's a must! As for pulls and knobs, you can really get away with any style, though some work better than others. Naturally. Choose the one you feel most comfortable with, above all, and then worry about its style. Some people feel most comfortable holding a knob, while others grabbing a pull. Trust me on this one, think very well what option your prefer first. We're actually loving recessed pulls these days, or even the ones insetted into the cabinetry for a cool modern look. We'll have a round-up of our favorite knobs and pulls one of these days, for sure. Here are the vanities that we've designed for the purpose of inspiration. As you'll be able to tell, we've attempted to create a wide variety of styles. Combining drawers, doors, open shelving, plus, knobs and pulls for a well rounded assortment. Which one is your favorite? I may be bias, but I really like them all. I think my absolute favorites, though, from both categories are #3 and #10.